Inflatable hot tubs might have been invented with the UK in mind. You can make the most of them during the warmer weather and then, when the temperatures drop again, you can store them away in a compact space. They’re genius and what’s more they come in a range of sizes, which means that even people with small gardens can often fit one in. Basically, you need a space which has a smooth, even surface and which can support the weight of a full hot tub (i.e. one which contains both water and people). You also need this space to be clear of anything which could puncture your hot tub. In addition to making sure the base is clear of stones, you’ll also want to think of anything which could pierce holes in the sides, thorns for example. One final point, which may or may not be a deal-breaker, but which is definitely worth considering, is the extent to which you want to have privacy in your hot tub and how this is to be achieved. For example, you may have plants (e.g. a hedge) to provide natural cover, but they may also drop leaves into your hot tub if you place it too close to them, so keep this in mind when considering the practicalities of siting your hot tub. One final point to note, before you take the plunge, is that a hot tub will require a bit of light maintenance. Basically you’ll need to remember to clean the filters and also to clean the water with appropriate chemicals (following the manufacturer’s guidance). You can reduce the amount of work you have to do yourself by choosing a hot tub which supports automated chlorination, (similar to the systems in public swimming pools). It’s also strongly recommended to put the cover back on the hot tub when it is out of use and to bring it into storage during the colder weather (as cold temperatures can make the outer material brittle). In fact, it’s best to deflate the hot tub and store it properly if you know you’re not going to be using it for a while (for example you’re going away on holiday). 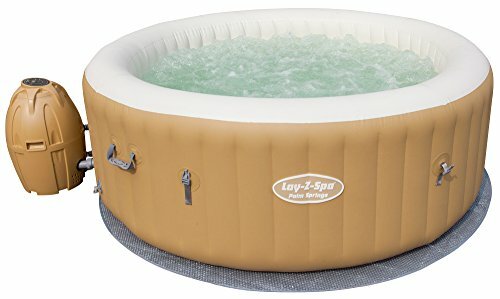 As a final point, most inflatable hot tubs have minimum and maximum water levels. If you try to run your inflatable hot tub too full, you will either get an error or have it shut off completely (depending on the model and the seriousness of the problem). Basically, if you have a problem with your inflatable hot tub, check the water level first, then check for debris and only then look for any other issues, but for the most part you can expect a high-quality inflatable hot tub to run very reliably. The reason we’ve suggested choosing your location first is because it will allow you to focus on hot tubs and spas which will fit the space you have to hold them. You might choose to buy a hot tub which is smaller than the maximum size and weight your space will permit but you will know to avoid going larger (and heavier). On that note, in addition to thinking about what could be called the useable size of the hot tub, you might also want to take a look at its deflated size. This may be stated in the description, if now, see if the retailer states the dimensions of the package you will receive as this will give you a good clue. In addition to size and weight, here are the other key points to check. Air jets, as their name suggests, push air into the water to create gentle jets of bubbles which create the sensation of a very mild and pleasant massage. Hydro jets push out water and air and therefore can create a much more vigorous effect. They are also more flexible in use as they can be angled so that they deliver the water jets right to wherever they are needed and the strength of the flow can usually be adjusted according to the user’s preference. In practical terms, air jets are more affordable and hence tend to be the preferred choice if a hot tub is just to be used for relaxation. Hydro jets, however, can be an investment worth making if the hot tub is to be used for medical purposes, e.g. enhancing circulation. The number of jets in the hot tub will also make a difference to its performance, although this has to be considered both relative to the size of the hot tub and to the type of jets used. A high-quality hot tub may well come with over 100 air jets but only 8 hydro jets. You will want to check the range of temperatures a hot tub can support and you may also want to be aware that the best hot tubs and spas will heat water in a very economical manner whereas hot tubs and spas with a lower up-front price can be a lot more expensive to run. It’s really important that your hot tub has a cover otherwise it’s very likely to become choked up with debris. This is not only unsightly but can impact the heater. Also, having a cover will help to keep the water in your hot tub nice and warm between uses, which is more economical than losing all that lovely heat to the air. Even in summer, it’s a good idea to have lighting for your hot tub. You can, of course, always add external lighting, but you might also want to have some internal lighting for the ultimate in either romance or relaxation! Even the best inflatable hot tubs and spas will make a degree of noise when the jets are on, but high-quality hot tubs will keep it reasonable, so that you can enjoy a conversation (and so that you stay on good terms with the neighbours). The popularity of inflatable hot tubs and spas in the UK has meant that there is a large (and growing) selection from which to choose. While choice can be good, it can also be confusing, so we’ve picked out what we think are the five best inflatable hot tubs and spas on the UK market at this time, based on quality (including quietness), reliability and overall value for money. Built-in control panel with buttons for jets, filter, heater and temperature control. We’ve listed the Abreo as a 4-person hot tub because that’s what the manufacturer says. In all honesty, we’d say that we don’t see this hot tub fitting four larger adults, but we think it could manage four smaller adults and we certainly think that there will be plenty of space for two adults and two children, which we guess is the target market for this hot tub. Overall, it’s a nice solid performer, which is easy to use and has an affordable price. Outer wall made from fabric coated material, insulated ground cloth offering good thermal retention. As far as we’re aware this inflatable hot tub and spa has nothing whatsoever to do with a well-known retailer with a similar name. It is, however, a solid offering in general and the fact that it has a built-in, hard-water-treatment system will have obvious appeal to the many people who live in hard-water areas. Even though the name says “Intex Octagonal” as far as we can tell, it’s completely round and the stated dimensions support our eyesight. We should also point out that Intex describes the jets as “bubble jets”, this is just another term for air jets. This hot tub was obviously designed to stand up to a lot of use and we really like its robustness and the fact that it is particularly economical to run. We also appreciate the fact that it has a hard-water-treatment system. With the Intex PureSpa you can enjoy a luxurious spa experience and relax in the comfort of your home. The PureSpa comes with a simple-to-use control panel that adjusts the heating system. The PureSpa provides simple maintenance with 2 easy-to-replace filter cartridges for clean refreshing spa water. Also: 1 x Chemical Floater, 2 x Filter Cartridges, 1 x Bubble Mat Floor Protector and 1 x Set Up and Maintenance DVD. 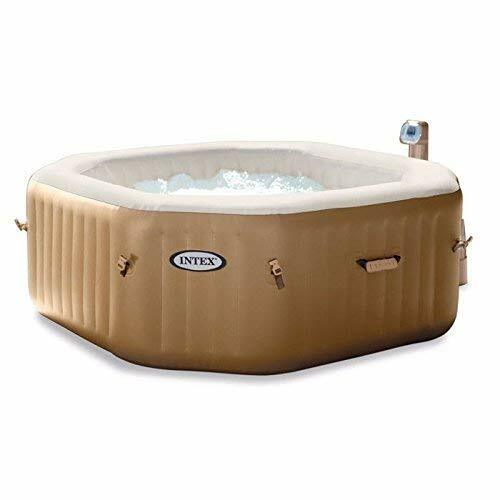 Lay-Z have become synonymous with relaxation products and while they’re probably most famous for their range of recliners, they also produce some of the best inflatable hot tubs and spas around. We could have recommended any of their inflatable hot tubs, but we opted for the Palm Springs as it is a mid-range model (therefore more affordable) and comes in air jet and hydro jet models. 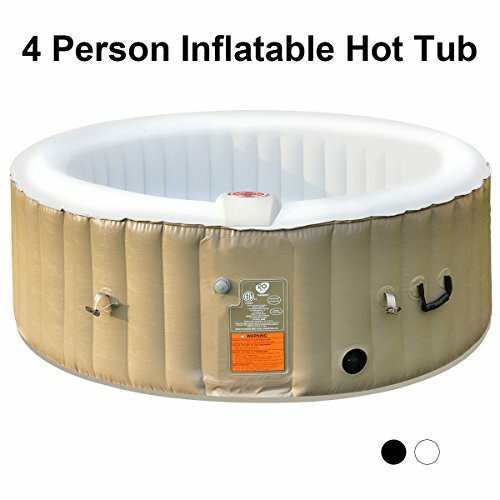 According to MSPA, this inflatable hot tub seats four people. We can only assume that they were very small people, in fact, we’re not even convinced that this inflatable hot tub would be suitable for two adults and two larger children. We are, however, happy that it will fit two average-sized adults comfortably. It doesn’t have much in the way of value-add features or extras, but it does work reliably and quietly. 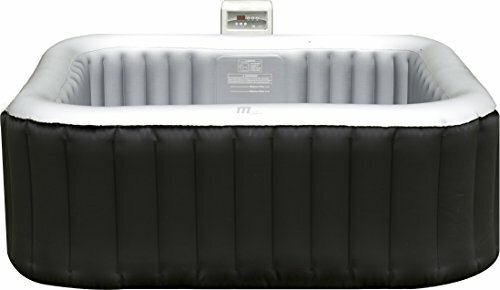 The Lay-Z inflatable hot tub and spa is, objectively speaking, the pick of the bunch – and is priced accordingly. If you live in a hard-water area, however, then you might want to go for the Costex or Intex options, which are not as premium overall, but which were designed to cope with hard water. The Abreo and the Mspa options are both great value both for price and for space and may let you squeeze an inflatable hot tub into your life even when you really didn’t think it would be possible.